kandeej.com: How was the GLAMINAR??? I had no idea that we would break all our records for having the most people ever come to the GLAMINAR!!! We had people from Germany to Florida and everywhere in between! This is not just a class about make-up, or how to become a make-up artist....this is an experience that will forever change those who were there! I cried with some of the precious people there...I celebrated their dreams, and inspired their hearts to take what they learned...but most importantly...how to take that knowledge and start making their dreams come true! People came that didn't even have an interest in make-up, and said they were amazed, and it changed them, and they are happier and more encouraged after going! Since so many people have requested more GLAMINARS...we will be launching an 8 city, GLAMINAR GOES GLOBAL tour for the next few months of 2010 (I have a small window of time before my kids go back to school! )....watch my blog in the next few days to see details on cities and dates! And 2 DINAIR Airbrush kits! To Model-in-a-bottle prizes, The new animal print Zpalettes, and an awesome Vanity Girl Hollywood Pink Starlet vanity mirror, like all the celebrities have! I can't wait to get to meet more of you...and for others to experience exactly what really happens behind the GLAMINAR doors! And i am﻿ glad you had fun! I wanna to meet you so much :) !! You have been so inspiring, it's beyond words. I love you so much and wish that you can come to Nova Scotia, Canada to do a Glaminar. Before makeup, I didn't think I was good at anything. If you come, it would really mean the world to me and lots like me who live here(nothing as awesome as a Glaminar happens here). PLEASE PLEASE PRETTY PLEASE WITH A CHERRY ON TOP. Thank You for posting this!! I really wish I could have been there but seeing the video helps :] You are so sweet and genuine and I love to watch all your videos. Since I started watching the tutorials I'm taking more care of them so I can do all those pretty looks! Keep up the good work. Love you :] KANDEEEEE﻿ ENKOREEEEE EVERYONE!!!!!!! you should definetly come to Austin!! I would love to come to one of your glaminars and meet you! I hope you come to Alberta, Canada!! It would be amazing and I would love to meet you! And I also want you to meet my beautiful daughter!! Love you Kandee! Come to DC! We need Glaminar! I'd love to meet you. I am happy you hade a wonderful time. You deserve it so moch. You have inspired me so much to reach for me dreams. If you only know how much you helped me. I hope you can have a glaminar in Chicago. I would be the first one at the door. Ohhh Kandee(: i'm so happy that the Glaminar turned out so well for you! That is such a HUGE success! perfect timing with IMATS too..
We "Chicagoans" are friendly and have good chocolate, will you come do a Glaminar in CHICAGO? In exchange, we will feed you "Fannie Mae" chocolates, Giordano's deep dish pizza (the best! ), take you to a huge Sephora on Michigan Avenue and lastly, we will be nice to you! I love you Kandee, it was a dream come true to meet you and get not 1 but like 10 hugs from you! Haha, and to get to win the very same Zuca bag you love so much was the cherry on the pie or cake... or cupcake! i'm so sad that i live in germany and you and your glaminars are so far away. Please come to germany or another european city! It's one of my biggest wish to be on a glaminar! Thanks for all your lovely words, videos and your great inspiration. It's crazy but all we crazy girls loves you! REALLY wish you could come to Norway, that would be so AMAZING. It makes me sad because its so far away, and i feel that im never going to meet you and give you a huge hug. I love your videos and your blog! I vote for a Glaminar in Richmond, VA - or, more likely, the Washington DC area haha. That would be lovely! Please come to the Pacific Northwest!!! I adore your videos, and your inspirational attitude!! I am trying to get back into "makeup artistry" after years of raising children and battling cancer. Taking your Glaminar could really give the boost I need to my resume and confidence! You make me look at life and even being a mom in a positive and magical way! 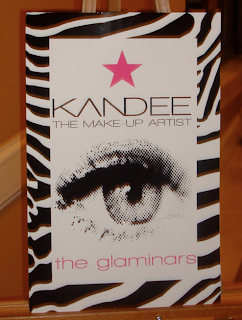 Kandee, where's the next glaminar? I just recently discovered your Glaminars and I am in AWE! I am a young wife and mother, and Makeup Artistry is what I want to do. I have known this for a long time, but living in UTAH, there arent many resources for the industry. I am saving my money so I can fly to wherever the next Glaminar will be. I am SO excited for this opportunity! Be looking for me! So excited you are coming to Toronto. When you say London in your tour do you mean London, England or London Ontario, Canada.